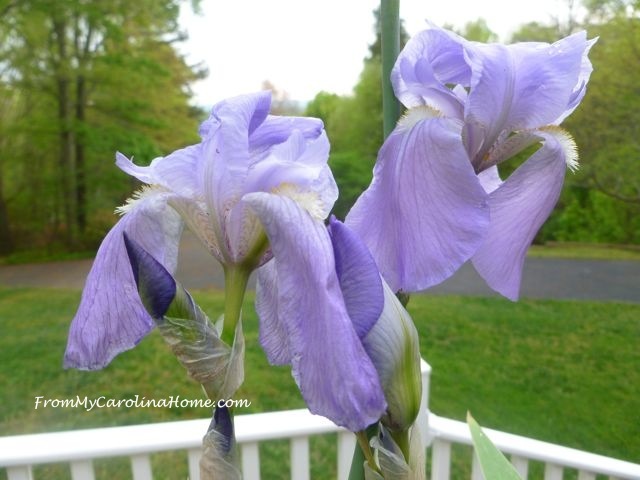 Today is National Iris Day, and I have been saving my odyssey to revive my purple iris flowers for today. I’ll show the progression of the beds, and give you some hopefully interesting Iris lore along the way. Did you know that the Iris is named for the Greek goddess of the Rainbow? She is called the Messenger of the Gods, and used the rainbow to move between heaven and earth. The flower was named the Iris because they come in every color of the rainbow. Last month I was lamenting how my iris bulbs would put out leaves but had not bloomed last year after I divided them in 2015. I created two beds from one by dividing the tubers. Their blooming had been getting more sparse each year. But after dividing them, they refused to bloom at all last spring. Only the untouched bed produced any blooms. Time for some research, and I found several sites that predicted I had replanted them too deep. I thought that couldn’t be the case, really, could it? They weren’t planted that deep. But one site had a Q&A section, and the answer to almost every question was ‘they are planted too deep’, and also said not to mulch them. Well, I had mulched them so maybe the site was right. They also desperately needed weeding. One fine day, I got out the kneeling pad and gloves, and reduced the level of soil over all the tubers. The tubers need to only be barely covered, with a bit at the very base of the leaf shoot uncovered altogether. OK, so I did that. I know flowers need phosphorus to bloom, so while I was at it, I added a top dressing of bone meal to the soil. Lucky for me, it began to rain the next day, so they got a very good soaking over several days. I have to say, the effect was almost immediate. In just days, the tubers began to put up flower shoots. They did so many I was afraid all the flowers would be done while we were in Myrtle Beach for a week. Did you know that in Japan, the Iris flower is believed to ward off evil spirits? People will put the blooms in their bath to prevent illness. In a few more days, those beautiful purple buds were developing nicely. In ancient Egypt, the flower with its three petals was the basis of their king’s sceptre signifying faith, wisdom and valor. Then, about 2 weeks later, the bud are showing, and more are coming! In Victorian flower language, sending a bouquet of iris blooms meant you were sending your compliments, or feelings of friendship, faith, hope and valor. The original bed is putting up multiple blooms on some spikes. In France, the iris is the basis of their fleur-de-lis design, symbolizing royalty. Also the second bed is coming along at the same rate. 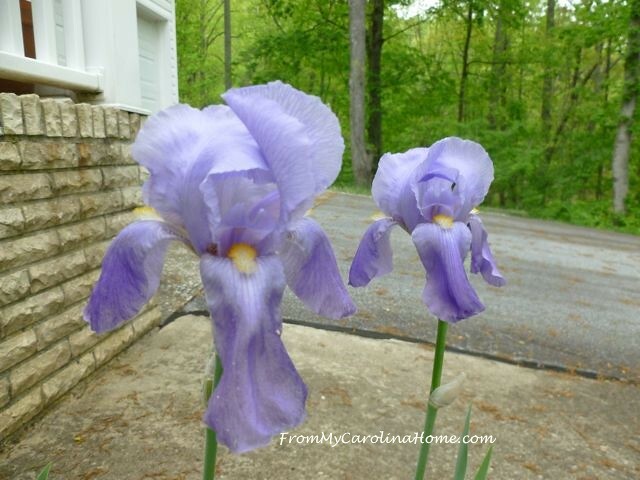 The purple iris is a symbol of royalty, respect, and wisdom. The tubers put out even more buds while we were out of town. I think the blooming season for them will last a couple of weeks at this rate. When we got back, there were a few that had opened up, and even more buds developing. The root of the iris plant when dried is called orris root, and is used in herbal preparations and perfumes as a stabilizer. Now, they are blooming their heads off, these in the upper planter are putting out multiple blooms per shoot. Although I didn’t do anything to the tubers in this bed, I did give them a top dressing of bone meal for the phosphorus. Both the reworked beds have the darker color blooms. I am really happy that they have begun blooming again. It is hard to believe the solution was so simple. The lighter purples of the upper planter keep going too. Those blooms just keep coming, going on more than a week now with more coming into flower every day. Some of the flower spikes have five blooms on them! Did you know that only the upper petals are actual petals called standards? The lower purple parts are septals called falls containing the reproductive parts of the flowers. The blooms just keep coming now, these are few days later. The second bed is full now, quite a contrast from nothing to this with just a little care. I don’t cut these flowers, preferring to enjoy them where they bloom. The original iris bed is getting full too, with all the green foliage on the mountainside as a backdrop. A few blooms are spent, but more buds are showing as well. I think this will go on for several more days, maybe even a week more! Do you have iris flowers? What is blooming in your garden? 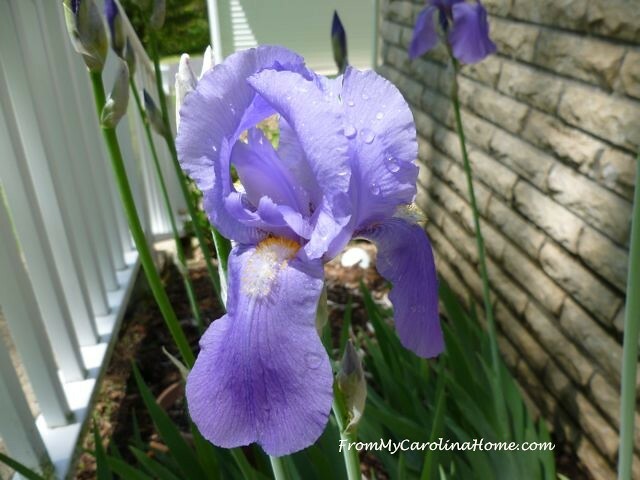 I love Iris flowers, they were my Mom’s favorite. Yours are beautiful. Iris do not thrill me in the tiniest bit. I have a lot of it, all inherited from a huge ginormous family iris farm in Carlinville Illinois. A family directly related to my husband. They have some huge Iris farm up there – The first owner was William B Otwell. He also started the Illinois Farmer Boys, which later became the 4-H. I sometimes throw some sun flower seeds and cosmos in the bed for later enjoyment, as iris is not exciting flowers to me. Flowers are God smiling on you! Thank you for wonderful days of blogging. These iris are beautiful. You’ve inspired me to take a look at my iris. The leaves are up, but no shoots yet. I gauge them by the neighbors and she has shoots. Our weather is colder here and we are behind on our blooms. My lily of valley is beautiful this morning and fragrant. I brought sime in yesterday as we were getting frist last night, which did happen. I had to cover my azaleas. I’ll have to look at my iris later today when it warms up. I think they got mowed over last year, but I’ve left my mower know that they’re flowers. Perhaps I should move them and make a rock bed for them. Hmmm. I have a vase of peonies and iris and columbines sitting here on my table. Such a joy! Thanks for the iris info! Who knew? I had an unusual bloom this year. All buds bloomed on the SAME day, perfectly spaced down the stem. 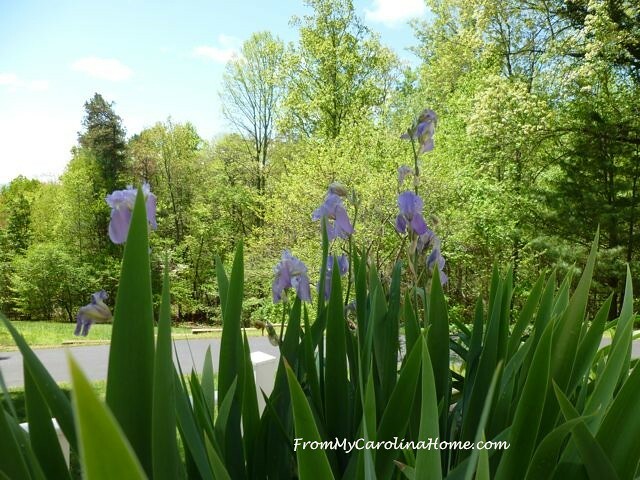 A GREAT year for iris plants! Now I think you have hit on my problem too. 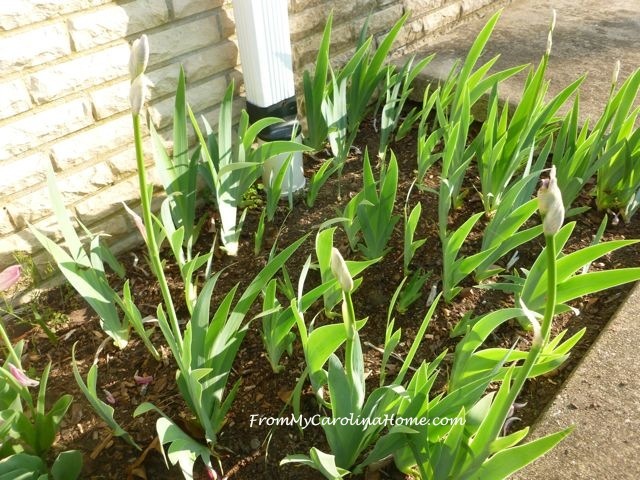 I have a bed of Iris that hasn’t bloomed for me either, I had one Iris that did and it just so happened it was a light orchid color, what about that? Next week will be pay week for me so I’m going to get some of the bone meal and do what you did by uncovering them a bit and treating them as you did. When I planted them about 3 years ago I used a spade that measured 6” and planted them so I planted them too deep . It is still on the chilly side in the mornings but its suppose to get warmer the next few days so this will be a great time for me to take care of them. I have quite a few plants but they never have done well for me, loved the lore stories, so interesting. Have always loved the fleur-de-lis design, have a lot of them around, boxes, charms hanging on my purse, even patterns to make out of liquid stain glass for my window in the foyer and I’ve wanted to make a pillow for my living room. The flower has so many great lores about it, happy to know about them, makes my like them even more, thanks for all your hard work looking them up and sharing them with all of us. Have a beautiful Iris day. 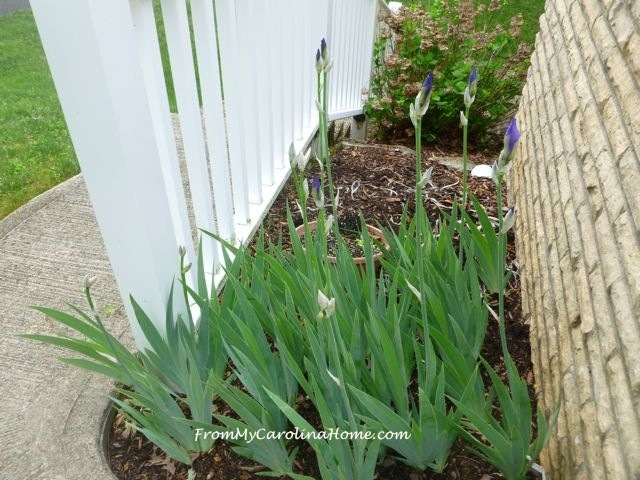 for years I had good iris’s then they seemed to stopped blooming and I wasn’t sure why – about 2 springs ago I pulled them all up and broke apart – replanted – reading also that they are to be barely covered and low and behold last year I had iris’s blooming again – again this year – more than I remember seeing in a long time. I began to look them over the other day and I think this fall once again though in some areas I will need to pull alot of things away from them – this area I am taking about has a lot of pine needles and leaves and things that wash in from heavy storms – I think they will get too deep again – I will need to watch that – I also have one more section that I need to dig up and break apart that is near the house. I didn’t add bone meal but we have a lot of pine needles maybe that helps too? I think Iris are my favorite flower and it’s sad that the blooms are so fleeting. My dwarf iris are in bloom right now. 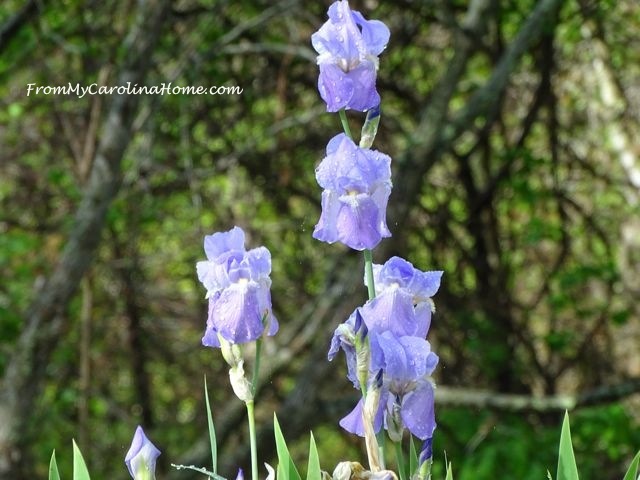 I have very few bearded iris varieties left. I have a problem with iris borers. And iris are supposed to be divided in July and August when it is usually too hot and dry here to tackle the job. Iris need regular division and you discovered the biggest mistake most people make of planting them too deep. The same thing happens with peonies, but at least they rarely need division. Anyway, glad to see your iris merrily blooming away. Your Iris are so beautiful! They are also my favorite color of them. My Mom used to plant them for me and they would bloom just in time for my birthday. Such a sweet memory. Thank you for sharing what you learned about growing them. Beautiful! I have wild flowers. The animalls around here eat everything else. Thank you for the tips on Iris, it any tubers survived, I could try your tips. 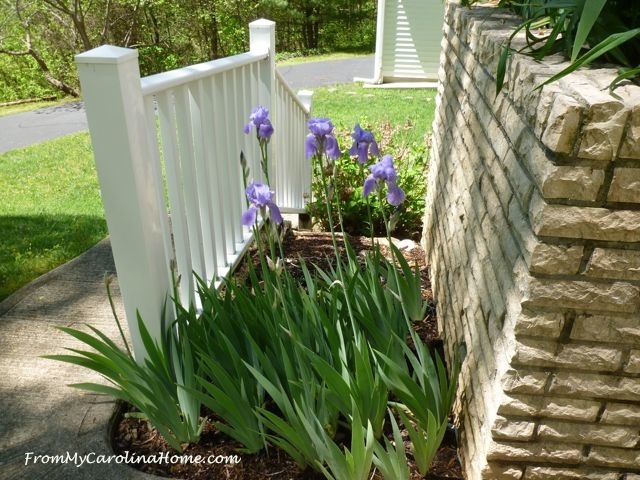 I have not had good luck with Irises and so I have a few questions for you…What time of the year is the best to plant them, do they need shade, direct sun, and do they take over everything around them like Lilies? Front yard iris just starting to bloom. Friends husband decided he did not like iris flowers( no idea why) and dug up all of her plants .brought me a box of them so now have to find spot to plant them. Shared a few with next door neighbor. Love all the stories about the flowers.Thank you for the lovely post. Loved seeing all your pretty iris in bloom. I have a miniature variety that is in bloom along with daffodils and a few early tulips. The larger iris won’t be blooming for a while yet. Enjoy your garden. These are gorgeous! It is hard to believe that sometimes a simple step can make such a big difference. Oh, what lovely flowers! I really enjoyed reading the lore surrounding the Iris and I loved reading everyone’s comments. What would we DO without the internet? You can research just about anything. Youtube is such a great resource for me. Beautiful flowers, glad you were able to solve your bloom problem. 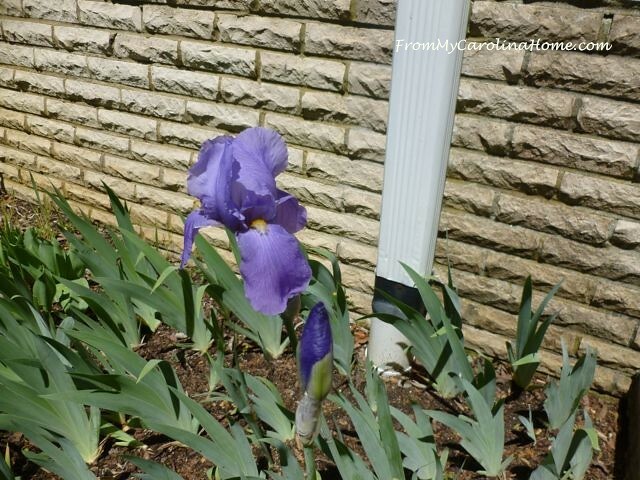 I did have success with iris a long time ago when we had a big garden in MA. When we lived in NJ, there was an amazing public iris garden in Montclair, truly spectacular when flowers of every imaginable color were blooming. I just have a couple of potted plants in my new house right now, but will plant a few dwarf trees in pots on the balcony after my travel-filled Summer is over. Then a couple of pots of veggies and flowers next spring. I enjoyed reading your educational iris information — interesting! I am not a huge fan of Iris, they seem a bit ungainly in the garden to me, though I have always have a few around. Mostly because of their amazing fragrance; you don’t mention if yours are fragrant, though I hope so! I grow a purple variety that smells EXACTLY like grape kool-aid — every year while my kids were growing up, they (as well as my husband and I) always had to sniff them when we passed by — still amazes me every time I smell that variety. And a second one I grow smells exactly like root beer! 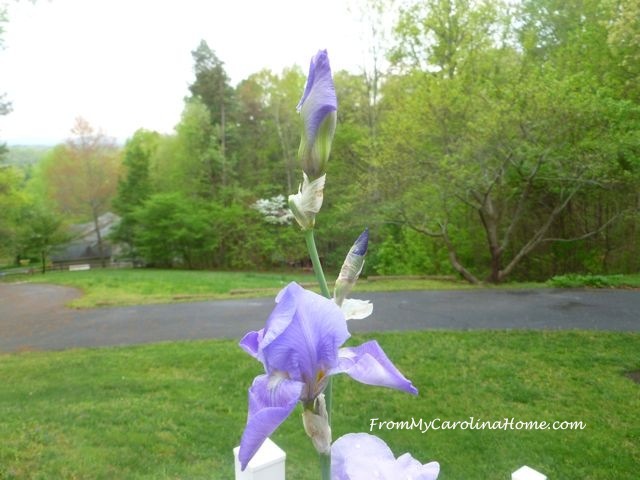 We call them our kool-aid and root beer irises, so I grow them for their fragrance and nostalgia, now that all the kids are grown and gone. I do grow some miniature irises, too, and love their appearance and growth much more than their larger cousins. You have reminded me how much I miss my irises, which were eaten by some dastardly underground beasts. Moles? Voles? Subterranean Bulb-eating Beastsrds. That was like magic, Carole! Last year we dug up our iris and planted them close to the top of the soil. We have blooms this year, but many did not bloom. I must get bone meal and see if your magic will work for us. Beautiful!! 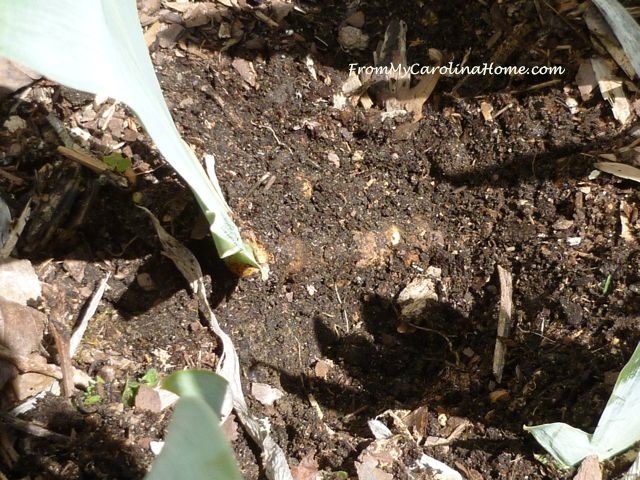 I was told by an iris grower to have the top of the rhizome level with the dirt surface. and if they are divided, cut any soft part off, leave out to dry really well, then replant, And down here, have the rhizome facing from south to north, They are a beautiful flower, and a lovely story to go with them. Now when I see a rainbow, will think of those words. Your research and hard work certainly paid off. Beautiful! Thanks for sharing your process and photos. 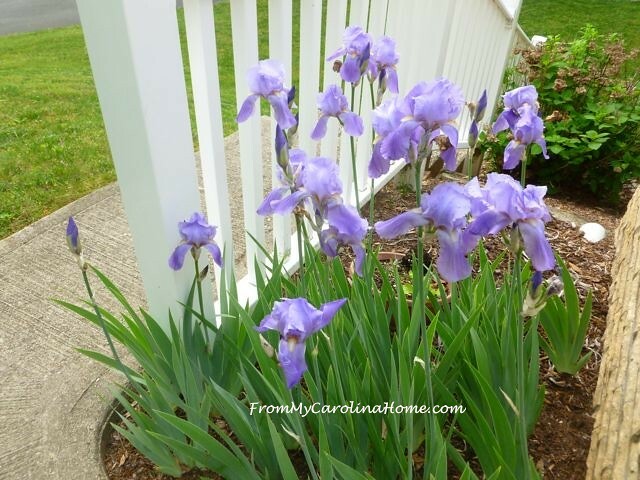 I love iris flowers, and this was a great post! I dumped some extra dirt on one patch in early spring, now I’m thinking I need to scrape it away, thanks for the info! No sign of blooms yet, but it’s too early here anyway. One patch, in the front garden, is absolutely getting overwhelmed with Tansy, I can’t imagine why the previous homeowners planted such an invasive thing in the main perennial garden! It’s awful, I’ve been ripping it out of other beds as well. Sigh. 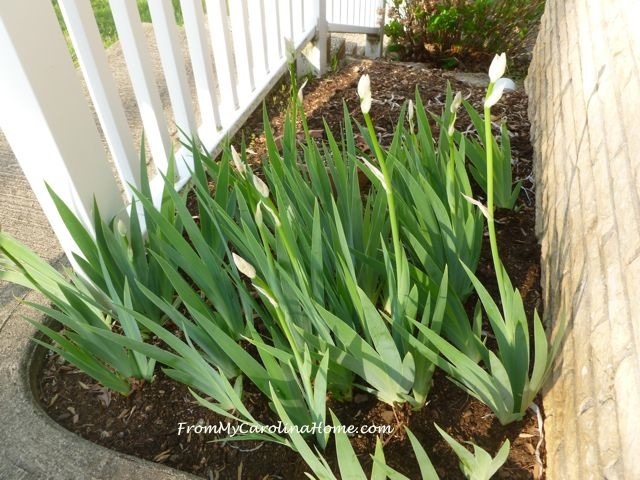 I like iris and have them in my Maine yard, but by the time I get there they are all but gone leaving behind their dead stalks. What a lovely informative post. You’ve inspired me to plant iris for next year so I can enjoy all that purple goodness. Holy smokes! You just answered my question as to why mine weren’t blooming. I did the exact same thing, so I need to go out there and take care of it. Thank you! When iris are planted too deep they can develop iris rot, which can spread, though there is an easy fix. Cut off the rotten parts then dip the rhizome into a light bleach solution, and allow them to dry in the sun for a day. Now you can replant in a clean bed, and though it may take them a year, they usually recover. I had my first bloom today from the early purples. The hybrids will come in 2-4 weeks, but these locals are always the first to bloom! Mine need a dose of bone meals this year when I divide them in June/July. Thank you for this post! The purple iris is my favorite flower. I’ve never grown them (I actually have a b r o w n thumb, and kill every plant I touch! ), but thoroughly enjoy them in other people’s gardens. Thank you for sharing yours! 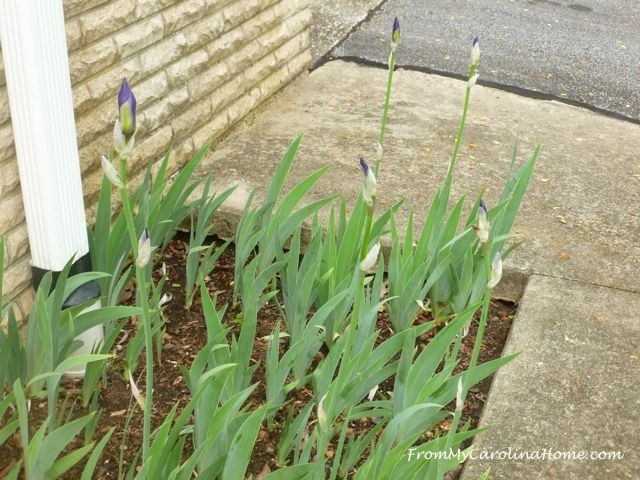 I have several varieties of iris, but my favorite ones are the light lavender ones that came from my grandmother over 40 years ago. When she divided hers, she threw the extra ones in the field across from her house. (My grandparents were farmers and had lots of acreage.) The field where she threw the extra iris was glorious in the spring, and as I said she only threw them into the field, never planted a single one. So they really do like to be almost on top of the soil! The ones I got came from the field and were probably 20 year old or older when I got them! I guess I should have read my mail this morning instead of at bed time. I coukd hsve written an Iris post for my blog too 😑 Yours are beautiful . Mine are doing well this year too. 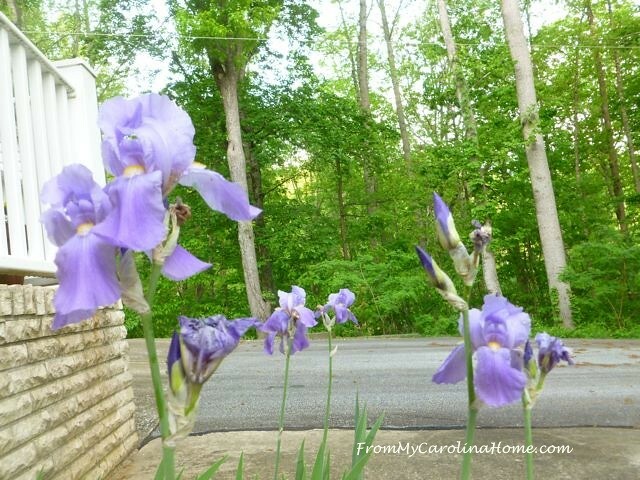 I was raised out in the country in northeastern Indiana and we had gorgeous iris plants all along the fence row, What a beautiful greeting every morning when they were in bloom. 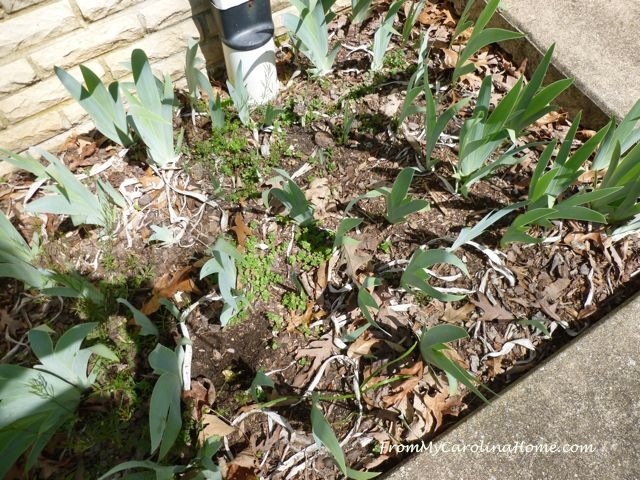 Well, I certainly learned a lot from this posting – for one thing, didn’t know there was a National Iris Day, and now I’m thinking my iris may be in too deep as they did not bloom like I thought they should last year – so far, just foliage on both the regular and the dwarf iris I have although a neighbor’s iris are already in bloom. I really enjoyed all the background information, too – very interesting. I remember when iris were sometimes called “flags” years ago, although I’m not sure why – guess I should just Google it instead of wondering about it…Anyway, thanks for an informative, beautiful, comprehensive and useful posting! I love iris flowers and yours are just beautiful. I have, at times, been guilty of burying mine too deeply and mulching too heavily. My purple and yellow coloured ones are my favourites – not flowering now, though. I did some weeding last month and my IRIS are blooming away too. Yours look great. I think I should sprinkle some bone meal! There are many Iris in my neighborhood, but I don’t have any. I wonder if that’s why my tulips quit blooming, too? I live on a hill and they are half way down, so maybe all the rain washed too much dirt on them. Maybe I’ll dig them up this fall and check that out. Carole, What lovely flowers. They look great. Have a great day. Sylvia D.
Yes, Iris do not like to be buried. 🙂 I have dug some up and then just sat them in the garden. planning to give them to someone. It didn’t happen and they still bloomed. lol! The Iris was one of my moms favorite flowers and I love them as well. I have about 8-10 varieties in my garden and love them. Also, they say to divide them in the fall. Is that what you did? If you divide them in the spring they usually won’t bloom till the following year. Glad you are getting such lovely blooms! Thanks for sharing with SYC. perennial seeds in the ditches hoping they would produce. 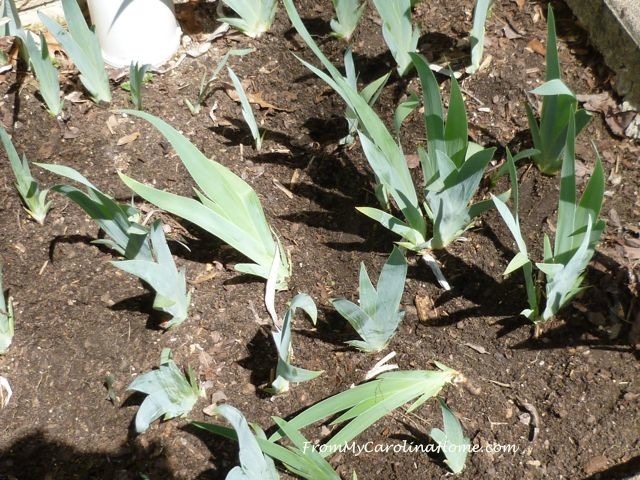 The dwarf bulbs were literally thrown in the ditch as I was thinning out. They multiply so quickly and are in amongst my other perennials so space is limited. Again, more thinning this year. Thank you for the iris history – so interesting. Thank you for this. I’ve done everything I should but haven’t tried bone meal. I seem to have acidic soil and my region should be very limey but this year I have such decreased bloom. I’ve also found that after I thin/separate the iris the next year they are healthy but not blooming. These are my favorites and I wait all year for them. I’m in Wisconsin so – zone 5.